POSH PREVIEW: Is it time to say goodbye to Gaby? Gaby Zakuani with his Peterborough Telegraph Sports awards in 2012. 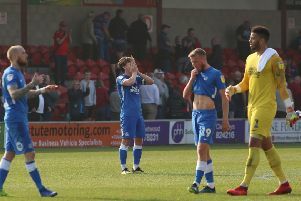 It could be time for Peterborough United fans to say goodbye to a long-serving favourite on Sunday (May 8, 12.30pm kick off). Central defender Gaby Zakuani is out of contract at the ABAX Stadium at the end of the season and has yet to be offered a new deal. Gaby Zakuani shows his passion. If it is the end, and if he plays against Blackpool this weekend, the 29 year-old will depart after 253 competitive appearances, the 13th-highest total in Posh’s Football League history. Zakuani has been part of two promotion-winning Posh squads after making his debut in a local derby at Northampton in September, 2008. He would rather stay at Posh, but if he does leave he would have no hard feelings towards those who make the decisions. He would take only good memories with him. “I feel like I am part of the Posh furniture, but if I have to leave I would go without any negative feelings,” Zakuani insisted. “It could be my last game. No-one has spoken to me about a new contract. I suppose it’s just got more complicated as we have changed managers. “I want to stay. My family is settled here and I’ve had eight happy years. “But it’s football at the end of the day and the club has to do what’s best for them. “I haven’t played that much lately, but at Barnsley and at Shrewsbury I think I showed my passion and commitment for the club still exists. “If I leave I would take some great memories of promotions and great matches. “It can be hard being a defender at this club, but I’ve genuinely loved every minute of it. The most successful manager in Posh history Darren Ferguson signed Zakuani from Fulham for a reported £350,000. He left the club on a free transfer for a brief spell in Greek football with Kalloni FC in January 2014, but returned that summer. He has built up a reputation among Posh fans as a tough-tackling, totally-committed centre-back. He won the Peterborough Telegraph Sports Personality of the Year and Footballer of the Year prizes in 2012. Injuries and regular international call-ups have restricted Zakuani’s appearances in the last couple of seasons. But his biggest regret is a very personal one. “I’m not even my kids’ favourite player,” he moaned.